In my last post I provided a sample Defend List based around three motorised Panzer Grenadier battalions drawn from the 1944 Panzer Grenadier Division. In this post I thought I would explore some options for the defend list. Supplement your Defend List before being subjected to a Hasty Attack by an enemy. Refer 5.1.1.2 of the Scenario System. Supplement your Defend List before being subjected to a Deliberate attack by an enemy. Refer 5.1.2.2. Supplement your Defend List before being subjected to a Spoiling Attack by an enemy. Refer 5.1.3.2. Given these tactical situations what would some useful reinforcements be? Remember you can have multiple option lists selecting one, or none, prior to the game. I will provide four sample lists to provide some ideas. This consumes, assuming the guns are off-table and German regulars, a total of 48 points. This leaves only 2 points for some light entrenchments. The artillery are clearly an expensive option but the powerful 150mm guns could be useful in defence or in a a fluid situation. The total for the above is 48 points after application of the various modifiers. Therefore 2 points remain for some entrenchments. This small list is rather useful. While the Werfers can be somewhat irregular in their targeting they can also be very effective, especially against massed infantry in the open. Of course if you are expecting to face Allied aircraft the flak will be extremely useful. Now one important point here is attachment limits. The Spearhead rules limit the attachments to a maximum of three companies per fighting battalion or the entire battalion. 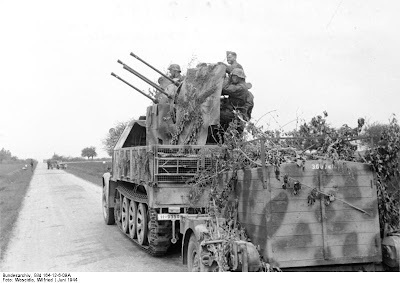 Assuming the Stug's are massed and attached to the weak Panzer-Grenadier battalion I can't allocate the above flak company and the Panzer Battalion flak company as it would exceed the three company limit. However, I can move the Panzer Battalion 20mm flak to another battalion, as it is a divisional support company, and allocate the Flakvierlings to support the Stugs. Another Option A list could provide some additional anti-tank capability. Very useful if you suspect your opponent will be using Churchill tanks! After modification for German regulars the 88s come to 38 points, meaning 12 points remain. These can be used for light entrenchments for the infantry or you may want to consider providing some light entrenchments for the anti-tank guns in an effort to protect them from an artillery barrage which is very likely to be called in on their positions. However, I must add this option is of most use in situations 1, 2 or 3 above and far less so when under taking action in a fliud operational situation as mentioned in point 4 above. Perhaps the final obvious Option A list is one with for counter-battery. Here is a sample Counter-battery list. All these troops, including the counter-battery observer, are off-table and all are German regulars. As a result the total comes to 46 points. This leaves only 4 points for some light entrenchments. 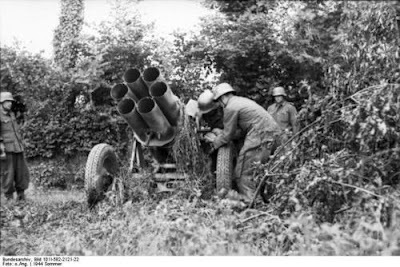 This is sufficient to entrench four stands of off-table artillery either the 150mm guns of the 105mm in the main list. Perhaps a useful option which may keep your own artillery operational.